On Iran, Japan's "Only Disagreement" Is Nuclear, Arrests and Press Crackdowns of Less Import? 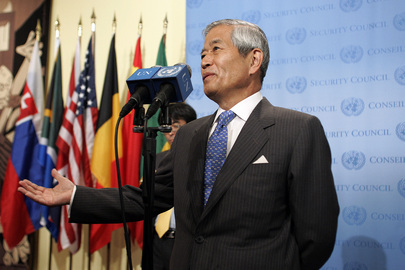 UNITED NATIONS, April 5 -- With Iran, "Japan has extremely good bilateral relations," Security Council President for April Yukio Takasu told the Press on Monday. "The only disagreement is this nuclear issues." Video here, from Minute 31:17. Inner City Press asked Ambassador Takasu is this meant that Japan did not share the concerns about the arrests and disappearances that followed Iran's last contested election.Video here, from Minute 37:17. Ambassador Takasu backed off this previous statement. "I try to emphasize... Of course there are many issues which Japan is involved in discussing with Iran. It doesn't mean all other issues, human rights, we agree with. Just the major issues... the Security Council is now involved in the nuclear issue." While some interpreted this as saying that only nuclear issues, and not human rights, are "major issues" to Japan, others analyzed that Japan is so concerned about North Korean nuclear threats that the precedent of Iran, it must fight. But Japan's less than human rights focused engagement with the Sri Lankan government, for example, of Mahinda Rajapaksa as it killed civilians along with Tamil Tigers in April and May 2009, as well as domestic treatment of women and immigrants, calls into question for some Japan's stance on human rights. It is one thing to prioritize nuclear issues over human rights. But to trade laxity on the latter for uncertain safeguards on the former is cynical. We'll see. Footnote: The timing of any Council vote this month on Iran sanctions may be impacted by the Council members' trip to the DR Congo, Uganda and Rwanda, from April 16 through 23. In the Council consultations Monday morning, it was emphasized how important the DRC leg of the trip is, given President Joseph Kabila's move to push the UN Mission out of the country in connection with the nation's 50 years of independence. When you subtract a full from a Council's month, it makes it marginally less productive. Marginally. Watch this site.